Quick-Release Ball Detent Pins from Pivot Point feature a ball detent that depresses and springs back up for “Quick-Release” applications. Used as a convenient way to adjust or remove accessories on equipment. 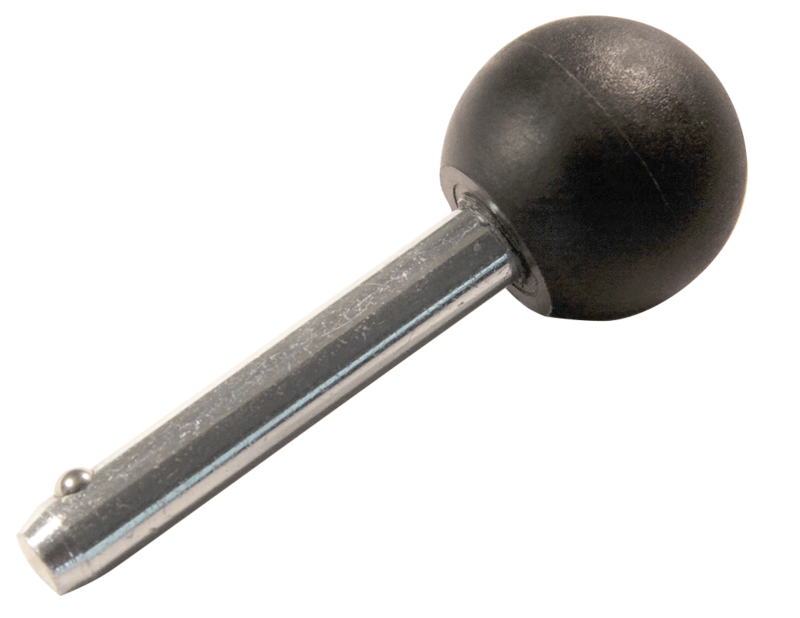 Featuring a black molded knob that is aesthetically pleasing and makes inserting and removing the pin simple. These pins are also known as Hitch Pins, Cotterless Hitch Pins, Cotterless Quick Pins, Quick-Release Pins, Quick Pins, Quick Lock Pins and Ball Lock Pins. Standard sizes are made from low carbon steel, zinc plated. Stainless steel Detent Pins are also available upon request. Rigid quality control procedures ensure a consistent fastener you can count on. Select “build your own” to customize a Detent Pin to your exact specifications! For other Quick-Release pins and Quick-Release devices, please see our Home Page to view other product offerings. Standard, stock Detent Pins are made from 12L14/1215 steel, zinc plated.